They’re on a mission to reduce the number of plastic water bottles thrown away each year - by making tap water taste better than ever! They’ve invented something pretty exciting. Well they didn’t exactly invent it. They’ve cleverly adapted a Japanese technique from the 17th century that purifies water by using binchotan active charcoal! The Eau Good Water Bottle from Black+Blum includes a piece of charcoal that can be squeezed into the bottle and then locked into the side. This revolutionary technique, reduces chlorine, taking away nasty chemicals and replacing them with minerals, while balancing the pH level of the water. The natural filter improves the quality of the water the longer you leave it in the bottle. Never before has water tasted so good! You won’t want to buy plastic water bottles ever again – thanks to Black+Blum. 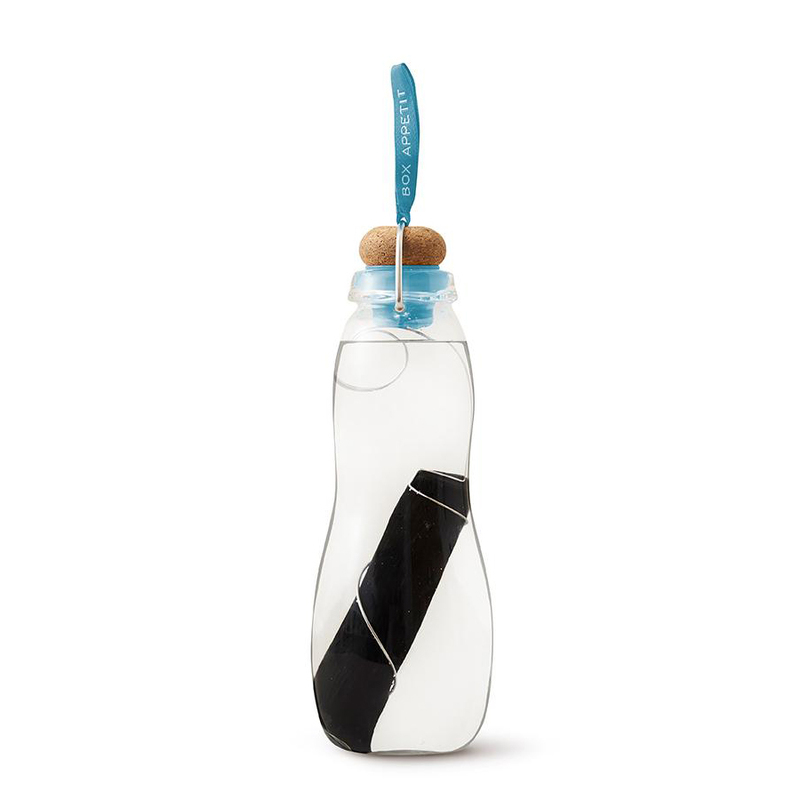 Made from hand-blown glass, cork, stainless steel and silicone. Includes a binchotan active charcoal filter – which lasts for six months. When you’re done, it can be recycled and replaced with a new one. The charcoal makes tap water taste good by taking out chemicals, and replacing them with minerals. Filter also balances the pH level. Secure your charcoal in place with the stainless steel coil. Replacement filters are available through the Black+Blum website. Dimensions: 9cm (d) x 24.5cm (h) (Including Sleeve).